I know it may seem like I am not getting much accomplished now that I am on summer vacation, but I must be doing something because I am exhausted at the end of the day. Aside from the Cocktail Testing, my kids and I figured out that Cups Trick Thing, we go to swim practice in the mornings, and I unloaded the dishwasher and folded a load of laundry. I have also been playing a lot of cards with my kids. My parents visited and kicked off this latest activity. We mainly play Crazy 8s, Solitaire, and War. I was “over listening” to Mr. Star Wars talk to himself during a recent game of solitaire, and it dawned on me how many skills are wrapped up in a card game. ** If you are unfamiliar with the rules of play, click here for Crazy 8s, Solitaire, and War. In order to play card games, the player has to be able to identify and/or separate the suits and the numbers. In Crazy 8s, the player can switch between the suit and the number at each turn. Deciding if you want to use a matching suit or a matching number requires a little bit of strategy (see predicting and strategy below). Kids have to be able to group and sort like items. When a kid plays cards, he is practicing basic math skills and symbol recognition that is helpful for early readers. The cards that the player holds in his hand can be grouped by like numbers and like suits (and then sub-grouped by numerical order). This reinforces organization and sorting. The goal of many card games is to gather cards in numerical order. In Solitaire, the whole point is to create a stack of cards that count down and also move them to the ace piles and count up. In the descending order piles, you have the added skill of a red/black alternating pattern. 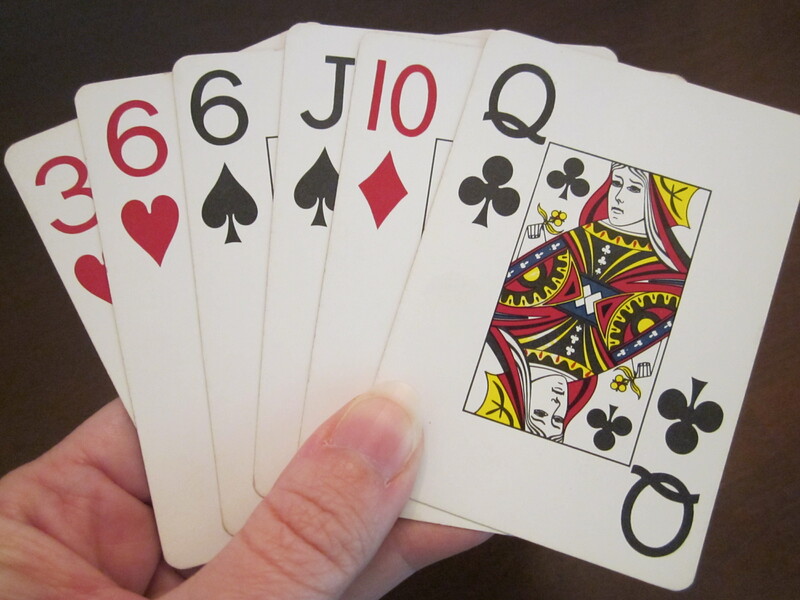 The player also needs to know which number is next and anticipate that card appearing. 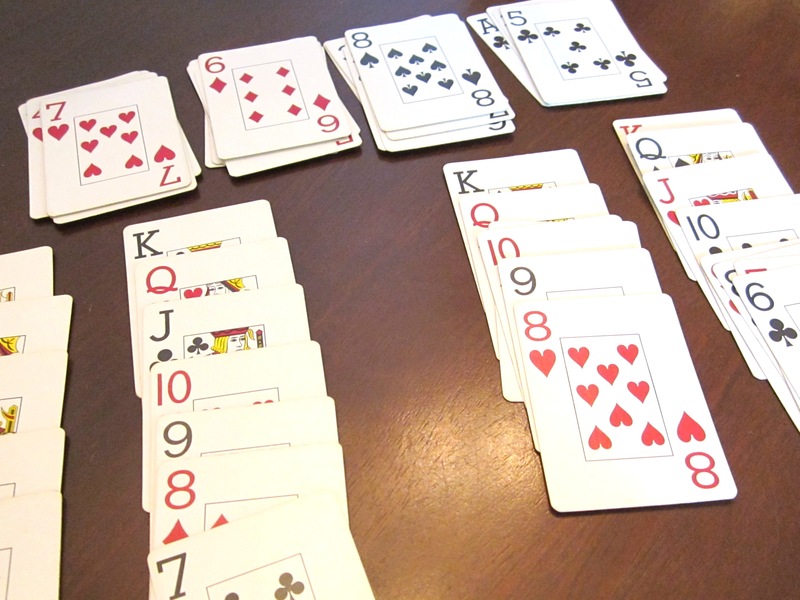 If your child’s teacher mentioned extra practice with ordering numbers, play a few games of solitaire with him/her. Players have to remember that a jack is lower than a queen, which is lower than the king. Depending on the game, the ace can change from less than the 2 to greater than the king. Kids translate the value of the face cards into a number value for ordering. Mentally renaming the card’s worth requires a multi-step thought process (i.e. critical thinking). In the game of War, you have to know the difference between greater than, less than, and equal in order to play. How many homework assignments have you seen that practice this skill? To win a game, there is a little strategy and a little luck involved. In Crazy 8s, you often hold cards in your hand that give you the option of putting down a matching number card OR a matching suit card– or you might even be able to play a crazy 8. Which do you choose? Well, if you are Miss Priss, you announce that you could do either (giving away what is in her hand), and you think through which one is the better choice based on what MIGHT be in the opponent’s hand. This is great processing on her part. She is not throwing down any old thing but is thinking about the alternative scenarios, the pros and cons of choices she makes, and the various outcomes of each choice. The same thinking process occurs in Solitaire. Mr. Star Wars always points out when he has two choices for his next move like if he needs a black 5, and he has one on the top of a stack of unturned cards and one in the group of 3 cards he has in his hand. Which option is better? Being able to anticipate results and seeing ahead down a few paths is a great skill to practice. Children need to see the direct results of choices they make. On a small scale, a game of cards illustrates cause and effect well. Sometimes you have to wait for your turn especially if the other player is contemplating his move. It might require some patience. Taking turns involves a specific order of back and forth (just like a conversation). One person makes a move, the other person responds, the first person reacts to the second person’s action. It is important to learn how to take a turn, wait, assess, and respond. The red cards are pretty easy to identify. Most kids know the diamond and heart shapes. In order to distinguish the black suits, we say that the spades (another word for a little shovel) look like a shovel. The club looks like a clover and both of those words start with the letter “c”. I caught TheRoomDad teaching the kids 5 Card Poker. Miss Priss told me that she doesn’t really know the rules, but she knows if she can get a group of cards in number order, that is good. If she can get a group of cards with the same number, that is good. If she doesn’t know what to do, she just keeps all of her highest cards. I have to say, I am fairly impressed with her strategy and have no doubt she would beat me in a game of poker.